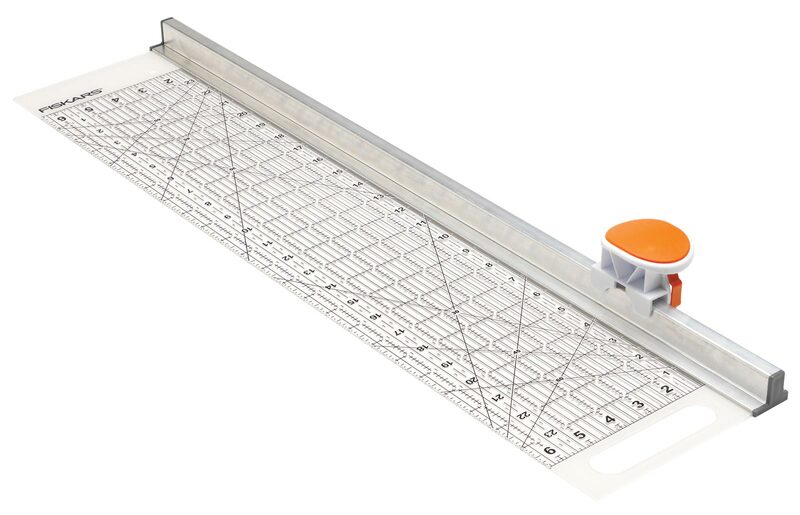 Fiskars took its 24-inch acrylic ruler with the orange and black lines and added a rotary cutter on a rail to make an all-in-one cutting product. To cut, I just press down on the combination blade cover and hand grip and slide it the length of the ruler. When I first saw this cutter at Wal-Mart, it stopped me in my tracks. I was amazed that no one had thought of that before. Since I routinely manage to misplace my rotary cutter even while using it, I like the idea of the cutter being attached to a large ruler. It is much easier for me to keep track of it. And when using the rotary cutter, I don’t always remember to retract my blade. But the cutter is so much safer with its auto-retractable blade. Now I don’t have to worry about accidentally bumping against an open blade. The way you place your hands on the ruler — behind the rail that the blade rides on — the rail acts as a built-in hand guard. It would be awkward to use this ruler in such a way that you could cut yourself. The first thing I did when I got my new Fiskars rotary cutter was to take it to my friend Marie’s house. Marie had hurt her shoulder and had been unable to use her rotary cutter ever since. Marie’s shoulder would hurt after cutting only one strip. Since the rotary cutter uses a different motion, I wondered if Marie could use this rotary cutter without the pain. Marie cut several strips of fabric without any discomfort in her shoulder. She was amazed! Now she could go back to quilting again. Next, I compared the new cutter to using a separate ruler and rotary cutter. I found that I could cut up to six layers of fabric with it. But I would probably limit the layers to four because of the pressure I needed to apply for more layers. If I have to cut six layers, I’ll use my regular cutter. The blade will cut in either direction so I can use it with either my left or right hand. And it easily slides to either end of the ruler without cutting so I can position the blade properly to begin my next cut. I normally cut by moving my hand away from my body, and I had great success with this motion on the Fiskar cutter. But I didn’t do well trying to cut by moving my hand toward my body — it always took a couple of passes to get a clean cut. I suspect it is because I couldn’t apply pressure steadily enough to get a good cut using the backward motion. Since I’ve broken my leg, I decided to try it from my wheelchair. I found I could use it as well sitting as standing, as long as I could reach the other edge of the fabric. I have relatively short arms, so I couldn’t cut the full 24-inch span of the cutter. But I could do up to 18 inches quite nicely sitting down. I really like the rotary cutter for cutting strips from 1-1/2 inches to 6-1/2 inches. It will cut a strip as small as 1-1/4 inch, but a strip that narrow is so close to disappearing under the track that it’s hard to be sure you’re getting an accurate measurement. 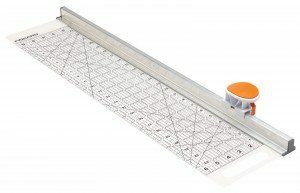 The only drawback of this ruler is that it is heavier than other rulers this size because of the cutter and track assembly. Its size and weight makes it a little awkward to use for sub-cutting small pieces from strips. But on the flip side, the extra weight helps keep the ruler steady when making long cuts, so my strips come out straighter. uses the same blades other Fiskars cutters use, including the specialty blades. 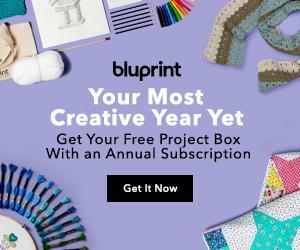 This means you can use it for crafts and paper projects, too. And it uses the same easy-to-change system as the regular rotary cutters. If I could make one change to this product, I would make the 1/2-inch line between every inch mark black instead of orange so that it would be easier to read. But even without this feature, Fiskars has another winning idea in this great cutter. Pingback: What's a fat quarter? Pingback: How do I add sashing to my blocks?